On June 20, 1996, Minerva Guadalupe Pérez Torres became a victim of forced disappearance. While she was originally from Masojá Shucjá in the municipality of Tila, the offense was carried out by 30 members of the paramilitary group Paz y Justicia in the community of German Miguel. 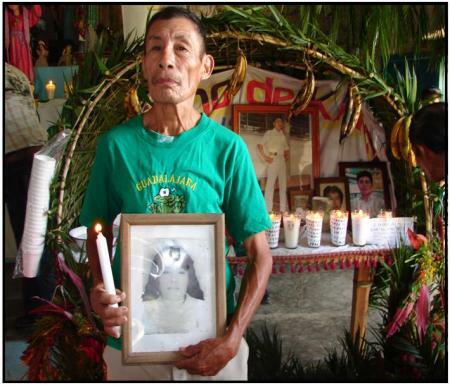 14 years later, the Human Rights Center Fray Bartolomé de las Casas (CDHFBC) has recalled this and other disappearances, noting that the State has not complied with the obligation to handle these as crimes against humanity as defined by the International Criminal Court. The Fray Bartolome de Las Casas Human Rights Center was invited. The communities that have suffered the same situation of war were invited. Other organizations were invited. The press was invited. In the northern region of Chiapas the community of Masojá Shucjá wants its dead to be remembered and continues to demand justice. But more than ten years later, justice has yet to be served. This past August 30th members of the Civil Resistance Movement Against High Electricity Rates (also belonging to PUDEE – People United for the Defense of Electrical Energy) and followers of The Other Campaign built an altar with flowers, candles and photos in Masojá Shucjá. The altar was raised not only in memory of those from Masojá Shucjá who have been killed and disappeared, but also in honor of the one hundred victims of the Peace and Justice paramilitaries in the northern region of Chiapas. Besides the imprisonment of five Peace and Justice leaders from 2001 to 2002, these crimes remain unpunished. On top of that it is feared that in the same way that perpetrators were released in the Acteal case, the few who have been sentenced in the northern region could be released as well. By candlelight at dawn on Sunday August 30th, indigenous Choles from Masojá Shucjá began to pray for their dead relatives and for peace. After sharing tamales and coffee the church filled for a memorial mass. At the end of the mass survivors and relatives of the victims gave testimony and shared in their ever-present pain. In the words of the Fray Bartolome de Las Casas Human Rights Center, when justice doesn’t come from above, it has to be built from the bottom up. This implies always remembering, never forgetting.